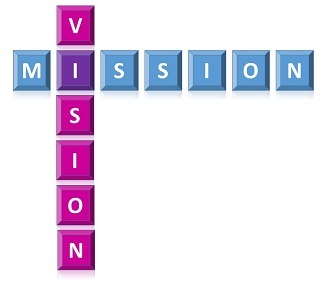 What’s the Difference between Your Company Vision and Mission? So what is the difference between your company’s vision statement and your company’s mission, anyway? I get asked that question a lot, since being clear about your vision and mission is critical to defining effective marketing strategies. Basically, your company’s vision is what you want your company to be known for, or to become. It’s long-term, and more of an image of how you want your company to be perceived, rather than a specific goal. Your mission, on the other hand, is more immediate: why are you in business and what is your company doing right now. Your vision should direct your long-term goals, and your mission should direct your short-term objectives. And hopefully the two point your business in the same general direction!